WHAT THIS COUNTRY NEEDS -- besides a good 5-cent cigar -- is more congressmen. Congress is broken. Maybe a few nuts and bolts were tightened when it came under Republican management in 1995, but by and large the place remains a mess. It is remote and out of touch, long on self-promotion and short on deliberation. It is filled with careerists and empire-builders, consumed with fund-raising, obsessed with publicity. It lards itself with perks and is waited on by bloated staffs. Its members worship polling data and dread taking principled stands. It is an exclusionary incumbents' club, with reelection all but assured for those who seek it. In a word, Congress is undemocratic. The way to make it more democratic is to make it bigger. When the 1st Congress was seated in 1789, there were 65 members of the House of Representatives. With the US population estimated at 2 million, that meant one representative for every 30,000 people, the ratio specified in Article I of the Constitution. Many Americans, including James Madison, worried that a 65-member House was too small to properly represent a nation of 2 million. But "I take for granted," he wrote in Federalist No. 55, "that the number of representatives will be augmented from time to time." In Federalist No. 56, he hailed "the foresight of the Convention" for having "taken care that the progress of population may be accompanied with a proper increase of the representative branch of the government." It was. When the 1790 census counted 3.9 million Americans, the number of House seats was enlarged to 105. Ten years later, the population had risen to 5.3 million; the House grew to 141. So it went for 120 years, with the House of Representatives -- the people's chamber -- growing with the people. But since the former never quite kept up with the latter, the average congressional district grew gradually larger. By 1910, the United States had 92 million citizens. 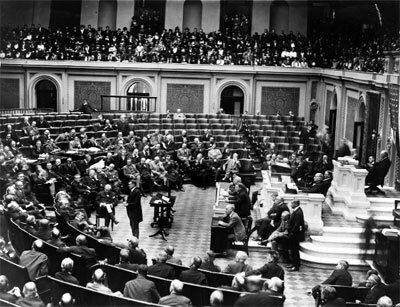 In 1911, President Taft signed a bill expanding the House to 435. The ratio of congressmen to citizens now stood at 1 to 200,000 -- a big drop in representativeness since 1790. But a far deeper plunge was to come. After the 1920 Census, Congress refused to enlarge the House. Many members resented the swelling ranks of urban and foreign-born voters, and balked at creating new seats to accommodate their numbers. In 1929, the size of the House was frozen at 435. Henceforth, districts might be redrawn -- but there would be only 435 of them, no matter how the population grew. Today, there are 260 million Americans, and each congressional district contains 600,000. The Constitution's framers would have been appalled. "The representative ought to be acquainted with the interests and circumstances of his constituents," Madison wrote. That may be possible when you answer to 30,000 of them; it is unthinkable when you represent 600,000. No wonder Americans think members of Congress are out of touch. They are. Among the world's leading nations, the US House of Representatives is the least democratic body of its kind. In Japan, each member of the Diet's lower house represents about 245,000 people. For members of the German Bundestag, the ratio is 1 to 123,000. For the French Assembly, 1 to 100,000. For Canada's House of Commons, 1 to 96,000. For Britain's, 1 to 89,000. If congressional districts were shrunk and the number of House seats hiked, many of the ills we associate with Congress would recede. Because they would be representing fewer people, House members would be closer to their constituents. Smaller districts would be harder to gerrymander, thus more compact and coherent. With fewer voters per district, one-on-one "retail" campaigning would become more important -- and expensive mass advertising would diminish. As the price of campaigns fell, representatives would be weaned from the seaminess of nonstop fund-raising. Smaller districts would mean more competitive races. That would make candidates and campaigns more meaninful to voters who today are apathetic or cynical. Incumbents would be replaced more often. But then, congressional careerism would diminish, since members would no longer be investing vast fortunes to win office (and depending on incumbency to keep the money flowing). Smaller districts would be more homogeneous, making it easier for politicians to take firm stands. And more seats in Congress would mean more points of entry for underrepresented citizens, from racial minorities to blue-collar workers to retirees. A bigger Congress would be a better Congress, but how much bigger? Going back to the Framers' ratio -- 1 to 30,000 -- would mean 8,600 members: clearly too many. But 435 is clearly too few. Why not a 1,200-member House? That would put the ratio at 1 to 200,000 -- about where it stood in 1910, when Congress stopped growing. For a nation of more than a quarter billion people, 1,200 representatives is hardly excessive. It would take a bit of getting used to. Congress would have to make some adjustments. (Smaller staffs, for starters). But enlarging the House would be worth it. It would lead to a Congress that was more representative, and make the world's greatest democracy more truly democratic.